Whether you make a living as a photographer or just capture moments as a hobby, you know photography gear is to be taken seriously. And by gear we mean not only lenses and tripods, but also software tools. Editing, watermarking, resizing, organizing — this toolkit of photography software for Mac will have you covered. Take a look. Having robust photo editing software on your Mac is almost as important as shooting on a good camera with a powerful lens. Pollar gives you the editing power you need in a clean and glossy interface. 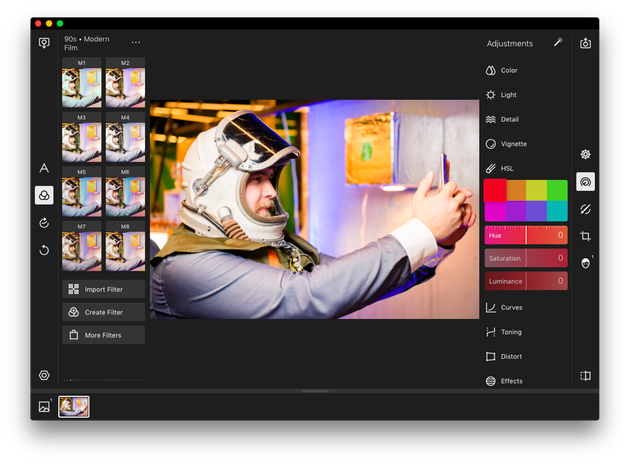 With numerous filters, you’ll quickly jazz up your photos before posting, while more advanced controls let you do anything from color correction to retouching. Plus, Polarr has built-in tutorials for all major controls, making it the best photo editing software for non-pros and beginners. It often takes a dozen takes to catch the smile on your baby’s face or capture a skater in motion. The problem is that similar shots add up and make it hard for you to find the ones you actually like. And if they get out of hand, eventually you’ll find yourself running out of disk space. 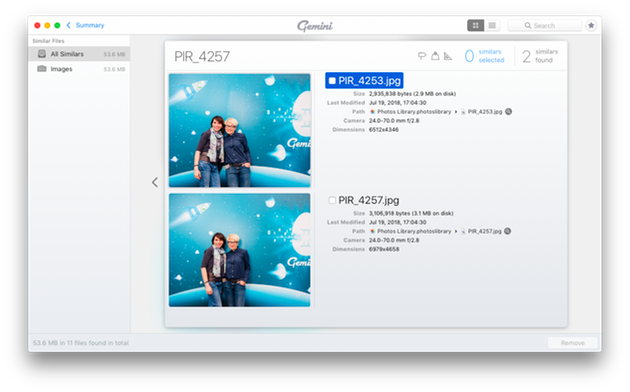 Before that happens, add a duplicate photo finder to your workflow. Gemini 2 finds not only exact duplicates (which typically appear when you merge several libraries), but also those lookalike photos. You can quickly compare images, check mark the copies you don’t like, and bulk delete them in a click. Photo management software for Mac is a whole niche, but honestly, the system’s own Photos is good enough for organizing your library (here’s a more detailed guide to organizing your library with Photos). Just like the iOS version, Photos on macOS automatically groups your pics into Moments, Collections, and Years. 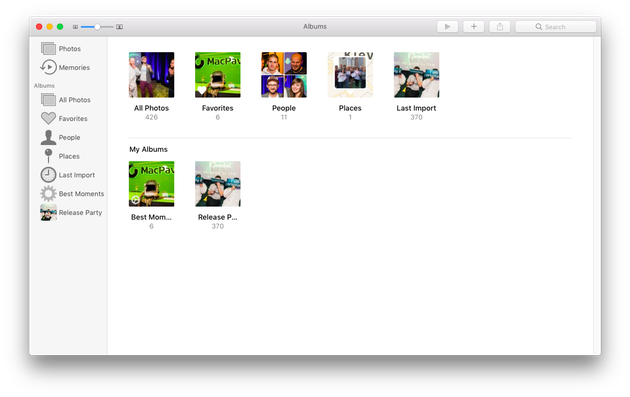 Plus, it creates separate albums for selfies, your favorites, panoramas, and videos. But the best feature so far is Smart Albums: it lets you group photos by a whole range of criteria, such as filename, date, camera model, and even the person in them. Speaking of which, you can search for a photo with a specific person in it, as well as try and find the photo you need by its content — like “cat” or “sunset.” So even if you never leave home without your camera and have thousands of pics to organize, Photos is up to the task. Organizing thousands of photos is a whole lot easier when you have a naming system. And while macOS offers basic renaming options, Renamer lets you get far more creative. 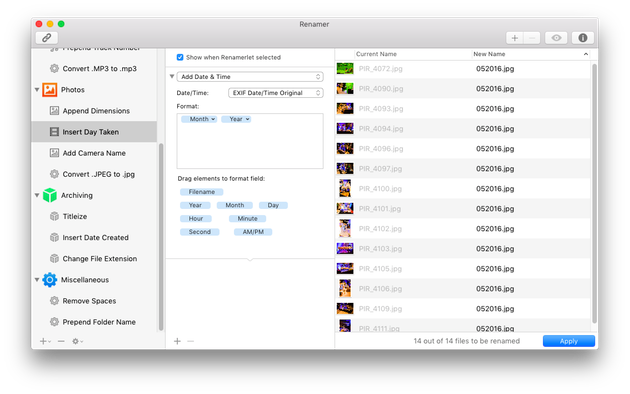 For example, you can add the day taken, dimensions, camera, or folder name — and even bulk convert JPEG into JPG to keep all your images consistent. Plus, if you make a mistake or a typo while renaming your whole photoshoot, you’ll fix it in a snap. Once you start getting your photos out there — posting them on Instagram, putting together a portfolio, or publishing them on your blog — you need a few additional tools. Watermarking, so you can establish a name and the content doesn’t get stolen. Resizing, so you can fit the photos into a blog post. Lossless optimization, so that your portfolio loads fast. 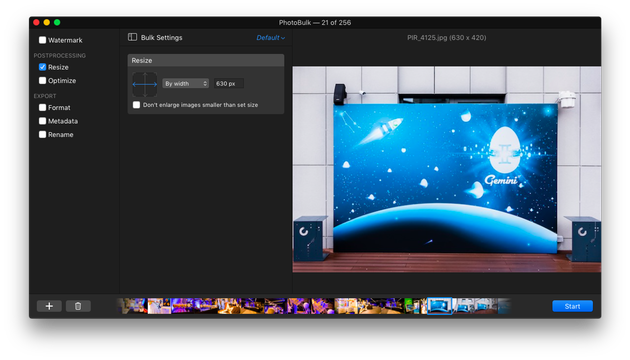 PhotoBulk helps you do all that in bulk, with the added benefits of converting images and managing their metadata. High-quality photos can be unreasonably heavy, and the web has no love for heavy images. If you’re uploading your work to a portfolio or a blog, huge photos can slow it down to a halt. 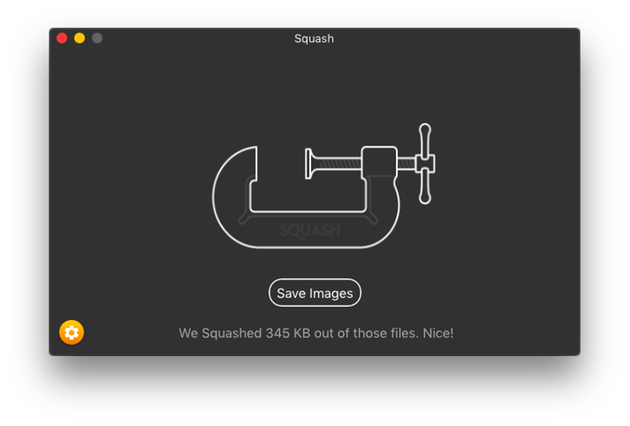 An image compressor for Mac like Squash will prevent that from happening. It’s a super simple one-click app that squeezes all extra data out of your photos and makes them a lot lighter without loss of quality. What was built as a platform for quick mobile snapshots is now a whole gallery for photographers of all levels. 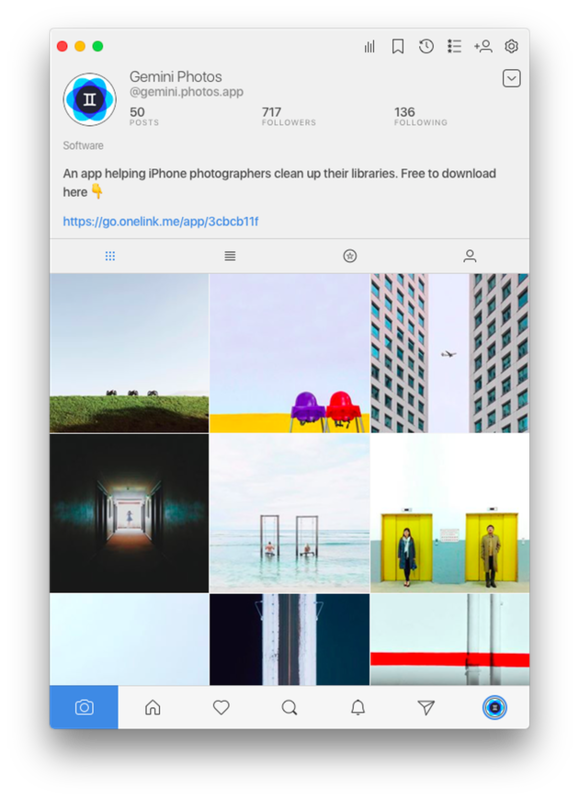 Nevertheless, Instagram is still geared towards mobile photography, so if you shoot on a camera and edit on a Mac, you probably have a whole procedure just to post to Instagram. But that’s about to end: with Flume, you’ll easily upload your shots to Instagram from Mac. A sleek, well-designed app, Flume gives you access to most Insta features: posting, commenting, your feed, editing your profile, and even direct messaging. It doesn’t support Stories, which is a bummer, but it’s still a better option than juggling pics between your Mac and your phone. Hope these tools improve your day-to-day as a photographer! If there’s a great app we missed, hit us up on Facebook, and don’t forget to share the list with other photography fans.